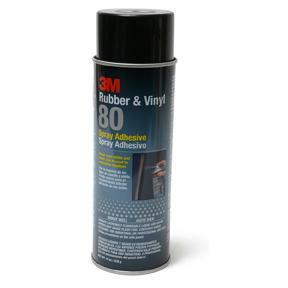 3M's 80 spray adhesive for rubber and vinyl's is a high strength neoprene contact adhesive. Excellent heat resistance, maintaining strength at temperatures up to 200 degrees F. Bonds rubber, supported vinyl, leather, flexible foam and plastic to themselves or wood, metal, particle board and other materials. Not recommended for polyethylene or polypropylene. Faster drying than traditional contact cements, with tack range up to 30 minutes. It will not break down with heat or water, so it's ideal for heavy weight headliners, hood silencer pads and vinyl tops. Contains no Ozone depleting ingredients. Features: The 3-way valve allows for the adjustment of the spray pattern from a narrow to a wide band for optimum spray control. Storage: Store at a temperature below 120 F (49 C).